Blog: Are Electric Vehicles Really Good For the Environment? ACUA recently added two plug-in hybrid Ford Fusions to replace several vehicles that have accumulated more than 160,000 miles in our fleet. The Fusion has as combined city and highway mileage rating of 88 miles per gallon using a combination of electricity and gasoline. Coincidentally, a study from the University of Minnesota was released this week and has been sparking headlines that electric vehicles (EVs) are not as good for the environment as they seem. However, what the study confirmed is that EVs are only as green as the fuel source they use to power up. Researchers compared traditional gasoline vehicles with alternatives like compressed natural gas (CNG), ethanol, diesel and EVs. Their findings supported the idea that consumers must consider the source of these fuels before deciding on how green the vehicle is. For example, the study found that traditional gasoline vehicles are better for the environment and human health when compared to EVs fueled by electricity made from coal. When electric cars are fueled by electricity made from renewable energy sources, EVs are significantly better than traditional gasoline cars. Our fleet of EVs is fueled by renewable energy sources – landfill gas at the Environmental Park, and solar and wind power at the Wastewater Treatment Plant. As the study stresses, anyone who is interested in driving an electric vehicle should be aware of where their electricity comes from. 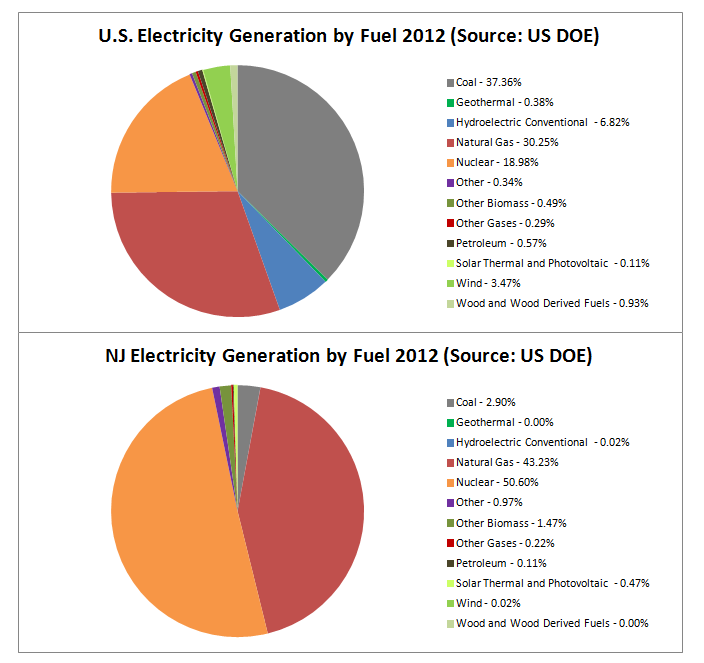 New Jersey receives only a small portion (2.9% in 2012) of its energy from coal as shown through the graphs below from the Department of Energy (DOE). Atlantic County residents interested in electric vehicles can also opt in to receive power generated from renewable sources through their electric company or use our charging stations as well as others located in Atlantic County, such as the parking garage in Atlantic City, that are powered by renewable sources.